Is dkos being played by Rove? ….Why is it that all we do is talk about McCain or Palin (look at the diary titles beneath mine)? Why do we put up so many diaries complaining about Obama that he should being doing this or that? What has happened to the positive diaries about speeches Obama makes from the trail (they exist and continue to come out each day), or of people’s positive experiences canvassing for Obama or registering voters for Obama? It is time for this community to get back to what it was doing just a couple of weeks ago — getting out and fighting to win this election, doing so with grit but also with a smile. Come on everyone Lets Get Fired Up and Ready to Go! I just wanted to say thank you so much for being the only blogger (aside from Al Giordano) who gets it. While the rest of the blogosphere (especially the liberal bloggers) lose their heads you are an island of common sense. Patience and Steel. Yes, yes. yes. It also occurs to me that in a way McCain and Rove have actually simply taken over the liberal blogosphere in some way. They are being played. Just a few examples—yesterday Obama gave a fantastic interview at the Service Forum. Did the liberal blogs even cover this? No. He gave a great speech on the trail. Are his town halls even posted or excerpted? No. The liberal bloggers have become McCain central. They make people click on his ads, make the world spin around him instead of focusing on our candidate and what he is trying to do. There is ZERO coverage of what Obama is actually doing every day talking tough on the issues. There is ZERO coverage of Biden (who is on the trail but the blogs don’t seem to care or cover him unless he is doing what they think he should be doing. Sadly AFP did cover him this week and people seemed to be too busy saying he was not doing anything to include the link with his forceful comments against McCain. The one time the blogs linked to Biden—when the MSM tried to make a big deal out his answer to a question that made Hillary look bad and he defended her. That was it). McCain and crew realized early this cycle that they did not have a visible internet presence. So what did they do? They took over the liberal presence, they are manipulating the leading liberal blogs , just as they manipulate the MSM. All to their own advantage. And the blogs have all fallen for this hook, line and sinker. Does no one realize this? They are all being played. And Obama, god bless him, he gets it. As does his team. while everyone whines he keeps at it every day with much much class and like a laser focused on the issues. The problem is not Obama, is that no one wants to follow his lead. Instead they are following McCain-Rove and they don’t even know it. Sorry bots, but Rove doesn’t need to play you. Obama already played you. Now you’re bringing your own candidate down by spewing your vile rage and hatred at Sarah Palin. It’s different this time, isn’t it? When you did it to Clinton, nobody (except a bunch of old, menopausal, “low-information” Democratic women) called you on it. Republicans are different from Democrats. They stand up for other Republicans. They play to their base instead of trying to drive it out of the party. Congratulations. You used slimy smear tactics to win the primary for your candidate. Now you’ll have to figure out how to get him elected without all the people you and he disrespected all through the primaries and during the convention. It couldn’t happen to a better bunch of people. Meanwhile, a posse of Democratic lawyers, mainstream reporters, lefty bloggers and various other Obamaphiles are scouring the vast tundra of Alaska for something, anything, to bring down Sarah Palin: her daughter’s pregnancy, her ex-brother-in-law problem, her $60 per diem, and now her religion. (CNN reports — news flash! — that she apparently has never spoken in tongues.) Not since Henry II asked if no one would rid him of his turbulent priest, have so many so urgently volunteered for duty. THE SCENE: A small Italian restaurant in the Village. BARACK OBAMA and BILL CLINTON have just finished their lunch and are smoking cigars and drinking espresso. It is September 11, 2008, and their first one-to-one contact since the primaries ended. Phoniness is oozing from every pore of both politicians. The theme from “The Godfather” is heard playing in the background. BILL: Well, how’d you like the food? OBAMA (puffing on his cigar): Not bad, Bill, not bad. Chicago has great pizza, but the Italian food is much better in New York. Maybe Michelle and I will get a place here once I’m President, just like you and Hillary did! OBAMA (still totally insincere): Yeah, Bill, uh, me too. Anywho, I was hoping we could get down to business. BILL (the mask dropping away completely): Shut up, Barack. I’m talking now, and I’m the goddamn President of the United States. Show a little goddamn respect, you little pissant! BARACK (pulling up his chin and looking down his nose): Fine. I’ll take that from you – for now. Go ahead, (with sarcastic emphasis) Mister President. So, I heard that Palin gave an interview yesterday and the Tweeties are already shredding it. The NYTimes has an article about how Palin’s pipeline is still vaporware. Like we don’t know that there are forces out there trying as hard as they can to turn us off our food when it comes to Palin. The Teaparty Ten are hitting the talking head circuit shaking their fingers at us lest we abandon women to the Republican forced pregnancy squad. They must think we’re stupid. We’ve looked at the prospective Congresscritters’ web pages and a vast majority of them never mention reproductive rights. So, Barbara, Claire and Gloria, if you don’t go back to your older and wiser men who are in charge and tell them to put their money where their mouths are with respect to abortion, you might as well be picking table setting colors for the next Senate Ladies’ Auxiliary Garden Party. Here’s the thing, oh mighty powers that be: all primary season long, you have been telling us to get in line, corraling us like the women of some puritanical middle eastern country. You haven’t offered us anything in return. Our votes were seized, our candidate humiliated, our choices eliminated. Some of you have even written letters telling us how tiresome and irritating we are for asking for something for our votes. You’ve given us Barack Obama who has never met a principle he cherishes so much that he wouldn’t give it up in the name of post-partisanship or political expediency. When it comes to the two nominees we have to choose from right now, both options leave us cold. 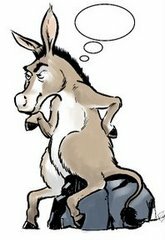 In the one case, the Democrat turns his back on his party when it is convenient while the other asks us to turn our back on our party to embrace the one that gave us 8 years of Bush. The Democrat has short coattails while with the Republican, we may end up with one party rule. But there is a potential tie breaker. It’s Sarah Palin. Despite the fact that her view of government is vastly different than ours, her candidacy offers us something. After she is elected to office, women who come after her will have an easier time getting to that top spot. And if that is true, then she may be doing more for women’s issues than any one of the Teaparty Ten who are appealing to the ladies. The next female candidate who runs for president may actually make it. It may take four years before we see a pay off but the long term goal is extremely attractive. Maybe we can get universal healthcare, full day kindergarten, equal pay in our lifetimes. So, all you guys out there furiously spinning the double standard that a first term governor of a state with two international borders is somehow less qualified to learn on the job to be VP than the first term Senator of a landlocked state is to learn on the job to be president, save your breath. When you took Hillary Clinton out, the game became much bigger than your petty interparty politics.